Member of Parliament from Khammam P Srinivas Reddy welcomes a TDP leader into the TRS at Sathupalli in Khammam district on Friday. 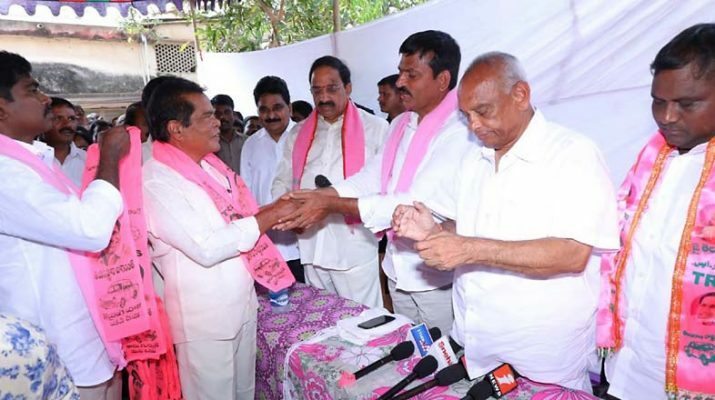 Sathupalli (Khammam): The TDP faced a serious setback in Sathupalli Assembly constituency as its senior leader Dr Kusampudi Narasimha Rao joined the TRS on Friday. He joined the party along with 300 other TDP workers at a programme at his residence in Sathupalli town on Friday. Narasimha Rao is the father of Sathupalli town TDP president K Mahesh. Roads and Buildings Minister T Nageswara Rao, MP P Srinivas Reddy and former Minister Jalagam Prasada Rao, party candidate Pidamarthi Ravi attended the programme and welcomed the newcomers. Speaking on the occasion, the Minister said he, along with Prasada Rao, had made great efforts to develop Sathupalli constituency on all fronts. No other leader in the constituency could claim credit for the development they achieved. 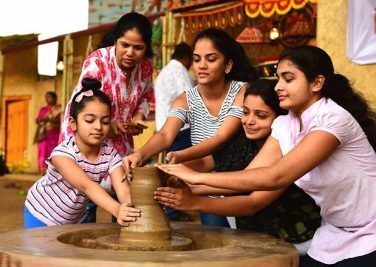 In every village, people would speak of the development works they have executed, he said and promised to ensure supply of water from the Godavari to the constituency in the days to come. MP Srinivas Reddy said ever since the TRS came to power, it had been giving priority to irrigation and added Sitarama irrigation project could irrigate 9.5 lakh acres in the district. Prasada Rao said he had joined the TRS because he was impressed by the growth achieved by the KCR government. He would work for the development of the poorer sections and tribals in the district. DCCB Chairman Muvva Vijay Babu, TRS leader Matta Dayanand and others were present. Later in the day, Srinivas Reddy, Prasada Rao, Vijay Babu, and Pidamarthi Ravi inaugurated the TRS election office at VM Banjar in Penuballi mandal and campaigned in Kakarlapalli and other areas.